The American people have, through “tolerance” and “apathy,” allowed God’s moral law to be lowered and by this they have dimmed the light by which these criminals are to perceive their own guilt (Exodus 20, 1 Timothy1:8-9). By allotting these criminals a pass (because some fell for the deceptive lie that they could not help themselves (Romans 6), they then want to claim they are exempt from the laws of our Republic, which they are not! 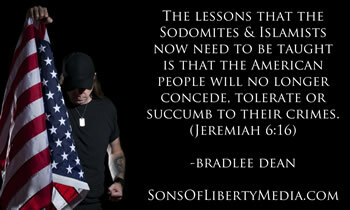 I have warned America over and over that the radical sodomites are being used as a political battering ram to up end the Constitution of the United States.